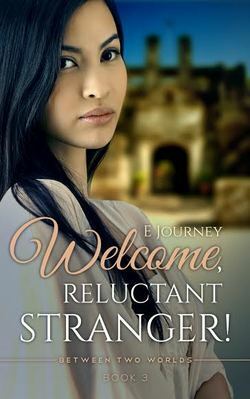 Q and A with author E Journey! To read a review of Hello, My Love! (Book 1 - Between Two Worlds) - click HERE. To read a review of Hello, Agnieszka! (Book 2 - Between Two Worlds) - click HERE. I was born in the Philippines, an only girl with three brothers; but I grew up with a very loving, indulgent grandmother and two grown-up aunts in a house full of my dead grandfather’s books. I got drawn into solitary pursuits. First it was drawing, then reading and writing. But through all that, I wrote fictional scenarios on loose sheets of paper. I guess back of my mind was a desire to take up that dream again. A dream buried for a while under the weight of daily life. When life eased up a little, and prodded by my geeky son, I started a blog which focused on art and the many trips (quite a bit of it for months in Paris) my husband and I took. Then, I began seriously writing a novel. Serendipity plays a part. I did research for Book 3 via weeks of emailing a young woman from across the Pacific Ocean who I found on fiverr.com. Prompted by my questions, she gave me a fascinating account of life on her island. She suggested Costa Mora as the island’s name and ended up a character in the book. You choose the name Between Two Worlds for this book series? How does it apply to the three stories written? Will there be more books added to the series? At the moment, I have no plans for another book in the series which is a family saga. Maybe I should have given the elder Halversons five instead of three children. I’m working on a short book of short stories. No happy-ever-afters. The short story is where I explore the sadder (but not depressing) side of being human. I’m calling it Brief Encounters with Solitary Souls. Unless you write like Jane Austen (who seamlessly weaves a satire on manners into her stories), romance by itself is titillating but, really for me, not that interesting to write. Adding intrigue and mystery takes romance to a different level. A love story, though, is the pivot around which subplots revolve. But as I say in a recent article, The Naked Art of Writing and Painting: loving is not something you can take outside the context of how a particular life is lived. So, ultimately, the story becomes about the broader sweep of life. How is writing scheduled into your life - so many hours every day, a few days a week, when the mood hits you, etc.? What is the biggest challenge you face when working on a new book? I have a schedule. First three hours after breakfast and a few hours in the evening when everything is quiet. I don’t always write. Sometimes I just read. I believe reading makes you a better writer. I’m bogged down most by obsessive-compulsive tendencies. After I’ve self-edited a book several times, I always find something else to fix. It’s not easy for me to say, “Enough already.” Even after a book has gone through professional editing and is published, I’ll find phrases or even sections I wish I’d done a little differently. Many people find that, rather than talking to someone, it’s easier to pour their most intimate thoughts—whether happy and comforting or depressing and scary—on real or virtual paper. Therapists have known this and that’s why, along with art and music therapy, they have writing therapy. But, most of us don’t need or want therapy. We can keep journals of our thoughts and feelings to help us purge personal demons. I know people who write volumes. You can write letters to tell others the things you can’t say in person. The recipient can be right there living with you. My mom was a prolific letter-writer, as is my niece. Rewriting or rereading accounts of experiences can be transforming. You see experiences from a perspective detached from the emotions initially associated with them. You don’t actually need words on paper. Storytelling began with people who spin stories to share them orally with people. Sharing stories brings people together, forges a sense of community. Some famous writers attribute healing their psyches to writing. In the article, I mention Alice Walker and Herman Miller, but there are lots more. I culled quotes out of the internet from writers who attest to the benefits of writing. My favorites, though, come from E.L. Doctorow—Writing is a socially acceptable form of schizophrenia—and Ray Bradbury—You must stay drunk on writing so reality cannot destroy you.